You see something online you want to explain. You could instruct others to go there and explain when they are looking at it. It is easier just to take a screen shot and include an explanation right there. The problem is finding a tool that does this job well. There isn’t many. I get why there are so few good tools. Screen capture tools is not a huge market. It is fairly niche so I completely understand why business wouldn’t want to sink massive amounts of money into it. Yet, it is a tool that is only going to grow in importance and use as more teachers deliver their content online. If you are looking to annotate what you see online, here are the some of the best free screen capture tools I could find for teachers. In fact, a screen capture tool can make every teacher more efficient and effective at developing their online content. I use it to annotate screenshots of things that students and staff need help figuring it out. Because the screen capture tool exists above the content rather than in it, screen shots can do a lot to explain certain content or steps. There are ways to capture screen shots without having to find and try out additional tools. On a Mac, simply hold down Command+Shift+4 and it will bring up a screen capture tool. On Windows, it is even easier, just hit the “print screen” button on your keyboard. On an iPhone hold down the Home and Sleep/Wake button. On an Android, hold down the Power button and the Lower Volume button. 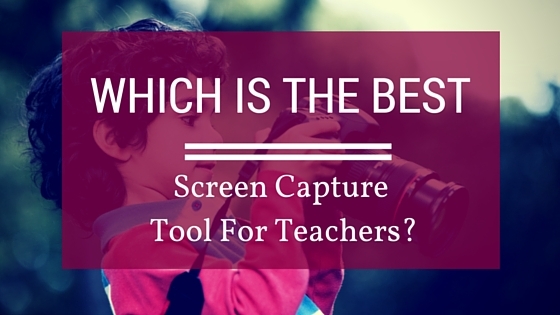 All options get the job done but are not the best screen capture tool for teachers. What Makes Up The Best Screen Capture Tools? There are some really easy ways to take screen shots to help your students. If you can so easily do it without a tool, why even bother using one? When I looked for a tool, I was looking for a solution. I wanted something that could quickly take a screen shot, annotate it, and then send it over to my Google Drive or Evernote for filing. I wanted to use a tool that would allow me to also blur out private information in the case that most of these screen shots would inevitably make their way online. The trouble is finding a decent, free, screen shot tool that does what I need it to do and easily. I already use enough technology in my life that I didn’t want a screen capture tool fighting me as I try to take a helpful screen shot of said technology. My list of needs certainly might not be the same as yours so I put together a list of 4 of the best screen capture tools for teachers I could find in a hurry. My hope is that this list can save you some time in trying to quickly build your instructional material. -Video capture works well for shorter clips but I tried one that was about 5 minutes long and it just kept on syncing without saving. -Cannot specify the resolution of the video capture. Depending on the screen, this can make some pretty blurry screencasts. ** After a couple of minutes, I checked my drive again and all the images did appear in there. I still don’t know what button I pressed to get them there. -Really, really fast screen capture. -Multiple options for screen capture. 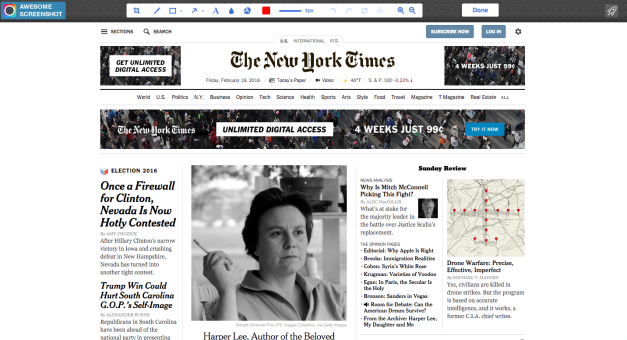 -Loads as a browser extension. Works on Firefox, Chrome, Opera, or Internet Explorer (not Edge). -No immediate annotations available. That means you need to load up the screen casting software in a different program to edit or annotate the images. -No screen-casting. Meaning you will need another software like Screencast-O-Matic to do your screen capture as well. Fireshot is a pretty decent free screen capture too if all you wanted to do was quickly save screenshots and easily convert them to PDFs. That is about it. With most of the functionality on Windows I didn’t get to really play around with the tool’s potential. But having a tool that could live across as many platforms as possible was something I didn’t need, but would have definitely liked. After all, Skitch is a tool that only lives on MacOS but I still love it. Overall, I think it was the lack of features and lack of a direct save to Drive feature that really limits this tool’s ceiling. -Has the precious blur feature. Long live privacy! -Can set resolution and file type when saving the screenshot. -Loads as an app on MacOS so you can use it offline. -Only for MacOS. Yep.. Only for MacOS, not even iOS. Evernote shut down the software on all other platforms in January 2016. -Loads as an app on MacOS. No browser extension means you need to load the app to take screenshots. I discovered a kind of workaround. At the bottom of Skitch there is a rounded button with the file type on it. 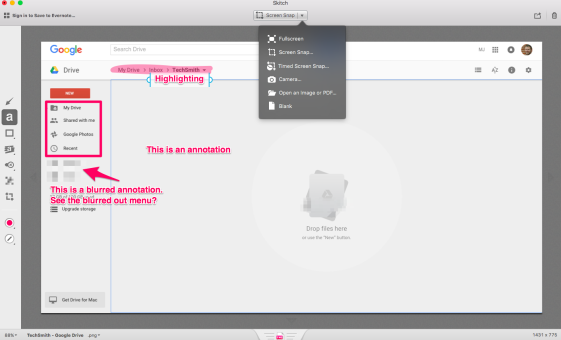 This lets you drag the annotated screenshot to the desktop. If you have your Google Drive open you can also drop it immediately in the folder you want it saved it. Not exactly a direct line, but it would work enough for what you might need it to do. Skitch was definitely my favorite tool. It is free and has a lot of features. There are many good paid tools out there but I was primarily looking for a tool that would do the most for the cheapest amount of money. With Skitch though, there is a real question of its longevity. It is concerning to see its cousin apps killed off on Windows, Android. How long will MacOS Skitch be around for? Don’t worry about losing any screenshots. Skitch doesn’t natively save any of your screenshots. It is simply the time you may invest (and love for the app) might be limited by platform and by Evernote’s commitment to keep it running. If you have the MacOS and need a screenshot tool, I would recommend you use it, love it, and savor every moment as the Skitch ship verges on sinking. 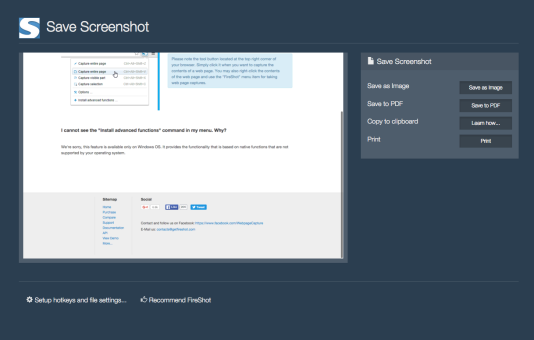 Awesome Screenshots is a pretty robust free screen capture tool. 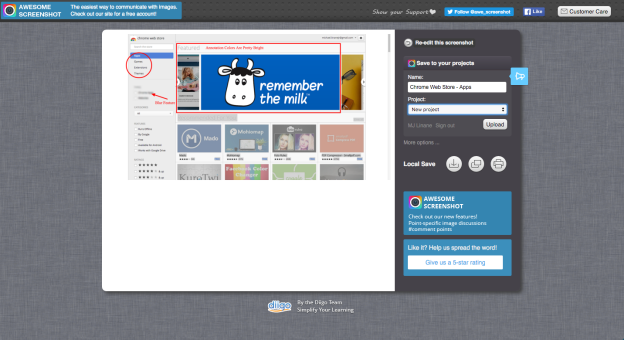 It has all of the great features you would need to quickly capture and annotated a screenshot. The drawbacks are the absence of video capture, the small number of free screenshots, and the separate server space. 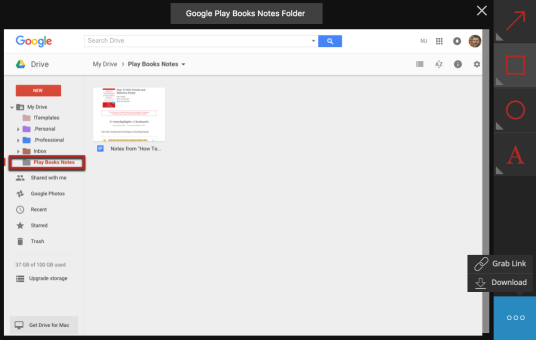 One of the key items I wanted was a tool that could quickly send annotated screenshots to my Google Drive. Having a separate space didn’t much fit into my overall goals. If you don’t mind having them in a separate website, I would highly recommend Awesome Screenshots as the go-to tool. When you are planning out your tutorials and lessons, make your life a little easier by making sure your tool does everything you need it to. All of us have too much to do to be disappointed by a loot that doesn’t meet all your expectations. 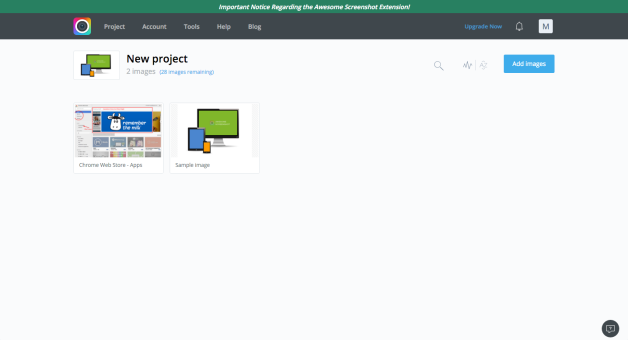 Questions: What features do you need to quickly capture tutorials for students or staff? What tool are you using now that you love? Good to know these screen capture tools and thanks for the sharing. I used to capture screenshot with acethinker screen grabber, free and works quite well for me. You might add it to the list. Thank you so much for adding to the discussion. I never heard of it but will check it out!